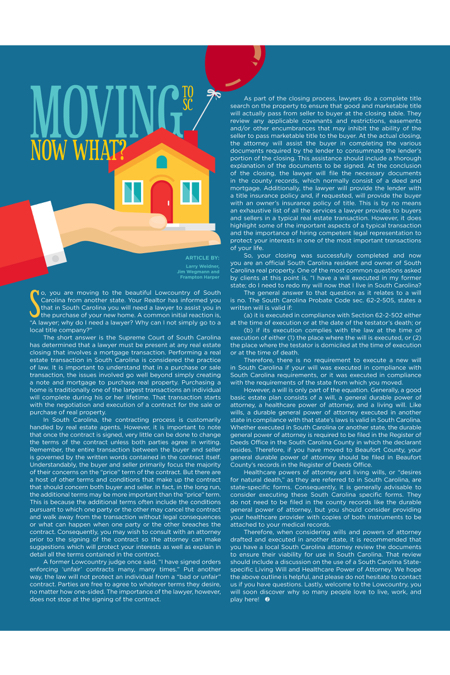 Hilton Head Magazines: CH2/CB2: Moving to SC? Now What! The short answer is the Supreme Court of South Carolina has determined that a lawyer must be present at any real estate closing that involves a mortgage transaction. Performing a real estate transaction in South Carolina is considered the practice of law. It is important to understand that in a purchase or sale transaction, the issues involved go well beyond simply creating a note and mortgage to purchase real property. Purchasing a home is traditionally one of the largest transactions an individual will complete during his or her lifetime. That transaction starts with the negotiation and execution of a contract for the sale or purchase of real property. In South Carolina, the contracting process is customarily handled by real estate agents. However, it is important to note that once the contract is signed, very little can be done to change the terms of the contract unless both parties agree in writing. Remember, the entire transaction between the buyer and seller is governed by the written words contained in the contract itself. Understandably, the buyer and seller primarily focus the majority of their concerns on the “price” term of the contract. But there are a host of other terms and conditions that make up the contract that should concern both buyer and seller. In fact, in the long run, the additional terms may be more important than the “price” term. This is because the additional terms often include the conditions pursuant to which one party or the other may cancel the contract and walk away from the transaction without legal consequences or what can happen when one party or the other breaches the contract. Consequently, you may wish to consult with an attorney prior to the signing of the contract so the attorney can make suggestions which will protect your interests as well as explain in detail all the terms contained in the contract. A former Lowcountry judge once said, “I have signed orders enforcing ‘unfair’ contracts many, many times.” Put another way, the law will not protect an individual from a “bad or unfair” contract. Parties are free to agree to whatever terms they desire, no matter how one-sided. The importance of the lawyer, however, does not stop at the signing of the contract. As part of the closing process, lawyers do a complete title search on the property to ensure that good and marketable title will actually pass from seller to buyer at the closing table. They review any applicable covenants and restrictions, easements and/or other encumbrances that may inhibit the ability of the seller to pass marketable title to the buyer. At the actual closing, the attorney will assist the buyer in completing the various documents required by the lender to consummate the lender’s portion of the closing. This assistance should include a thorough explanation of the documents to be signed. At the conclusion of the closing, the lawyer will file the necessary documents in the county records, which normally consist of a deed and mortgage. Additionally, the lawyer will provide the lender with a title insurance policy and, if requested, will provide the buyer with an owner’s insurance policy of title. This is by no means an exhaustive list of all the services a lawyer provides to buyers and sellers in a typical real estate transaction. However, it does highlight some of the important aspects of a typical transaction and the importance of hiring competent legal representation to protect your interests in one of the most important transactions of your life. So, your closing was successfully completed and now you are an official South Carolina resident and owner of South Carolina real property. One of the most common questions asked by clients at this point is, “I have a will executed in my former state; do I need to redo my will now that I live in South Carolina? (b) if its execution complies with the law at the time of execution of either (1) the place where the will is executed, or (2) the place where the testator is domiciled at the time of execution or at the time of death. Therefore, there is no requirement to execute a new will in South Carolina if your will was executed in compliance with South Carolina requirements, or it was executed in compliance with the requirements of the state from which you moved. However, a will is only part of the equation. Generally, a good basic estate plan consists of a will, a general durable power of attorney, a healthcare power of attorney, and a living will. Like wills, a durable general power of attorney executed in another state in compliance with that state’s laws is valid in South Carolina. Whether executed in South Carolina or another state, the durable general power of attorney is required to be filed in the Register of Deeds Office in the South Carolina County in which the declarant resides. Therefore, if you have moved to Beaufort County, your general durable power of attorney should be filed in Beaufort County’s records in the Register of Deeds Office. Healthcare powers of attorney and living wills, or “desires for natural death,” as they are referred to in South Carolina, are state-specific forms. Consequently, it is generally advisable to consider executing these South Carolina specific forms. They do not need to be filed in the county records like the durable general power of attorney, but you should consider providing your healthcare provider with copies of both instruments to be attached to your medical records.